Manhattan was the original location of Long Oil and home offices for the company. There were a number of service stations here. Also located in Manhattan was a large warehouse and bulk plant. The first drive-in gas station in Manhattan was a Long station located at 1st and Colorado. This was near the Union Pacific Railroad depot and at the foot of the Kansas river bridge. 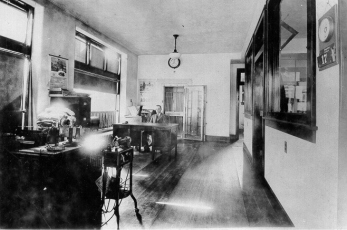 This first opened in 1915 and was the original offices of Long Oil. Bulk plant and trucks at 1st and Colorado, Manhattan, Kansas. Courtesy Kansas State Historical Society. In 1918 there was a new station at 17th and Colorado, which was located along the south route of US40 going to Colorado Springs. 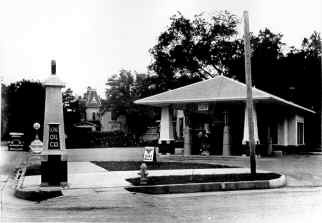 Also a new station opened on April 18, 1918 at 3rd and Houston (300 Houston). This is now a parking lot near the Town Center Mall. Northwest corner of 3th and Houston, Manhattan, Kansas. (1918) Courtesy Kansas State Historical Society. In 1919 a station at the corner of Manhattan and Moro, (southwest corner), was opened. This property was leased from H. P. Warham for many years. A record store is located at this site now. 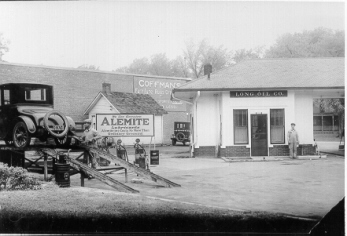 Station at Manhattan Ave and Moro, Manhattan, Kansas, 1923. Lower right of this photo. This photo was taken looking north up Manhattan Ave. Courtesy Riley County Historical Society. In 1922 Long constructed a station at 1215 Moro, this was located on the south side of Moro half way between 12th street and Manhattan Ave. and is currently the home for Rusty's Last Chance Bar. Also that year Long purchased an old church building located on the southwest of 5th and Poyntz and on Dec 23rd held the grand opening of the 5th and Poyntz station. Southwest corner of 5th and Poyntz, Manhattan, Kansas. (1922) Courtesy Riley County Historical Society. Southwest corner of 5th and Poyntz, Manhattan, Kansas. 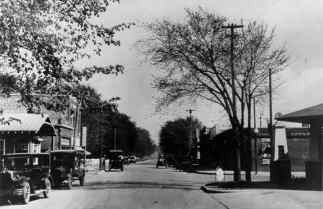 (1926) Courtesy Riley County Historical Society. 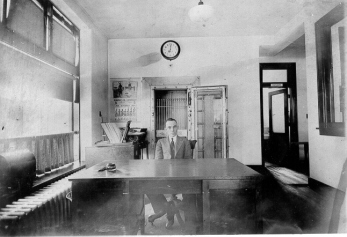 Then on July 14, 1924 Long moved his offices to 118 S 3rd. There were other operators that handled Long Oil products, two of which were Elmer Holbert 300 Thurston, an independent dealer and Walter E. Moore who ran the Ford agency. 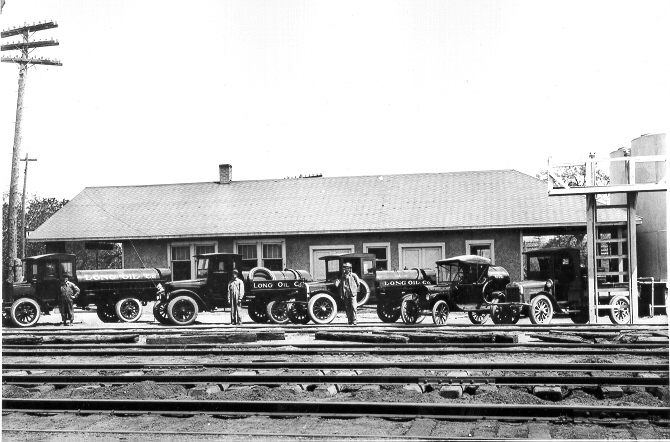 On February 1927 the bulk plant and warehouses at 6th and Riley were opened. At this time this facility was billed as the best of its kind in Kansas. 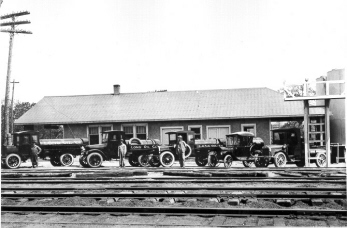 Here railroad cars of gas and oil were brought and repackaged or delivered in bulk to surrounding stations and farmers. These building are now used by the city of Manhattan. 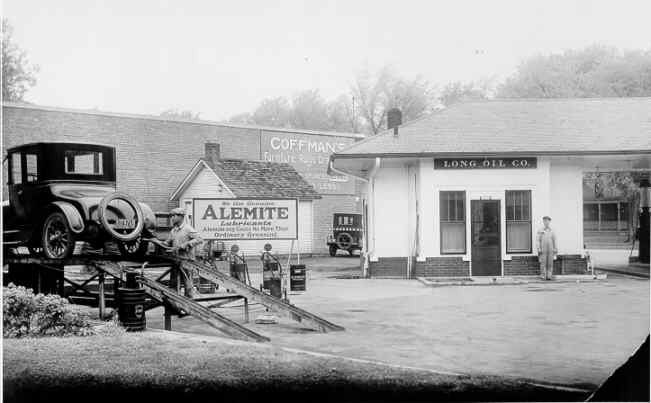 In 1928 Long tore down the original station he built in 1922 at 5th and Poyntz and constructed a new service station and stores at this location. This included a bus terminal, offices of Diamond Taxi, Manhattan Floral and Scheu's Cafe. 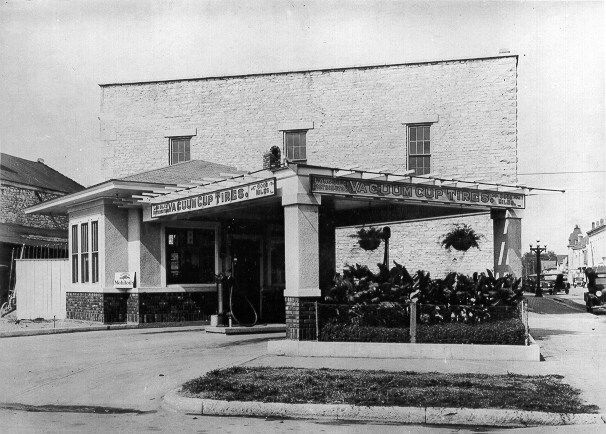 He held the grand opening on December 11, 1928.